When our book-crazy neighbour gifted this book to my children, what struck me first was the beautiful illustrations. Author-illustrator Bruce Peardon's heart-warming tale is one that any child will relate to, and the rhyming lyrics make it a joy to read and listen to. The book is dedicated it to his son Ben so that he and the future generations "will have the opportunity to enjoy the unique flora and fauna of Australia". The story centers around a teddy bear which is dropped accidentally when the little boy it belongs to falls asleep in his horse-cart on the way back home. 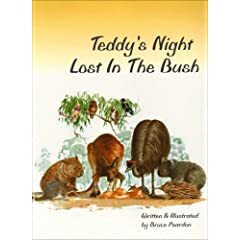 His parents drive on to their farm and put the sleeping child into his bed, unaware that the precious Ted has fallen in the middle of the bush. Ted lies alone all through the moon-lit night. When morning comes, Wombat waddles over and is puzzled about who the strange creature is. He asks Ted but gets no reply. He turns to Jack Possum who is equally clueless. They check with Mope Owl and when the owl also cannot shed any light, they decide to summon all the creatures of the bush to solve the puzzle. Soon there is a meeting and Billy Magpie, Major (the parrot), Emu, Tim the Koala, Alf Echidna, Numbat and Katie the Kangaroo all arrive. There is a brief 'exchange of words' between the echidna and the parrot but differences are eventually laid to rest and the parrot declares that he does know where the strange creature belongs. He tells them that he has seen it with his playmate at a nearby farm. Katie Kangaroo volunteers to tuck him in her pouch and the procession of animals heads to the farm. There's a lesson we all can learn,"
By caring for one another." At the end of the book, I came to the page that talks about the author. I was very surprised to find that Peardon had created the illustrations by painting with his mouth and feet. At the age of seventeen, he was severely injured in a car accident and as a result had quadriplegia and could not use his arms and legs. He was a member of the Association of the Mouth and Foot Painting Artists. His work has won wide acclaim within and outside Australia and many of his paintings are held in private collections. His love for the creatures of the bush shines through and my guess is that through this book, lots of children (and their envious parents!) will certainly enjoy the beauty of the Australian bush. choxbox, amazing find and the illustration in the cover page is very striking. wow, double-wow, choxbox. Love what the owl says - gosh if the whole text is like that, I am getting this book for myself! And look at the list of animals I can discover through this book with my kids. o.m.g. he painted that without his hands? I thought the strong message in a light package was cool enough...but am bowled over by the skill of the illustrator. inspiring to say the least! Such a sweet animals of bush tale, chox! Rhyming text, too! LOVE IT! Some reason today feels odd without a native folktale! :-( may be someone can point us to aussie/nz folktale..
found one on Amazon Klassic Koalas - couldn't find it at my LL. need help digging out native aussie folktales from down under! Thank you for this wonderful pick! Amazing bot about the painting without the feet - please tell me this is available here in India!? OH my, this one stole my heart! A great pick Choxbox and it is a very heart warming tale indeed. Truly inspiring to know the circumstances under which the author has done the illustrations for the book. Sheela: Yup the entire 46 pages are in rhyme! Get it I say! Praba: Hmm. Do let us know when you find one! Poppy: Know for sure you can get it at Chez Choxbox! Am sure we can hunt it out elsewhere too. 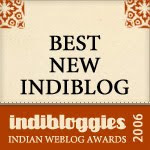 ssstoryteller: Do let us know when you do. And please move back! Thanks for the reference Chox.